Daily consumption of half-a-litre of sugared soda is linked with 4.6 years of additional biological aging, effects comparable to that of smoking, finds a new study. The study found that drinking sugary drinks is associated with cell aging, suggesting sugar-sweetened soda consumption might promote disease independently from its role in obesity. The study revealed that telomeres – the protective units of DNA that cap the ends of chromosomes in cells – were shorter in the white blood cells of people who reported drinking more soda. “Regular consumption of sugar-sweetened sodas might influence disease development, not only by straining the body’s metabolic control of sugars, but also through accelerated cellular aging of tissues,” said senior study author Elissa Epel, professor of psychiatry at University of California, San Francisco (UCSF). The length of telomeres within white blood cells has previously been associated with human lifespan. 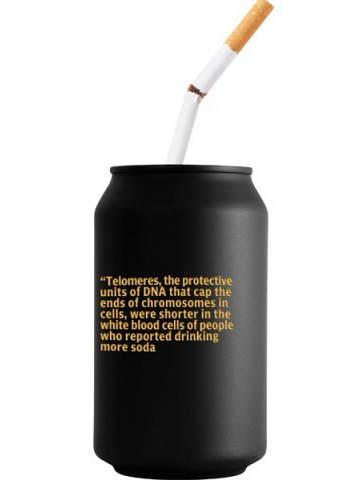 “This is the first demonstration that soda is associated with telomere shortness,” Epel added. This effect on telomere length is comparable to the effect of smoking, or to the effect of regular exercise in the opposite, anti-aging direction, according to lead author of the study Cindy Leung, postdoctoral fellow at UCSF. Short telomeres also have been associated with the development of chronic diseases of aging, including heart disease, diabetes, and some types of cancer. The researchers measured telomeres after obtaining stored DNA from 5,309 participants, ages 20 to 65, with no history of diabetes or cardiovascular disease, who had participated in a health survey during the years 1999 through 2002.